This is a thirty two ounce bottle of Bittydesign Liquid Mask. 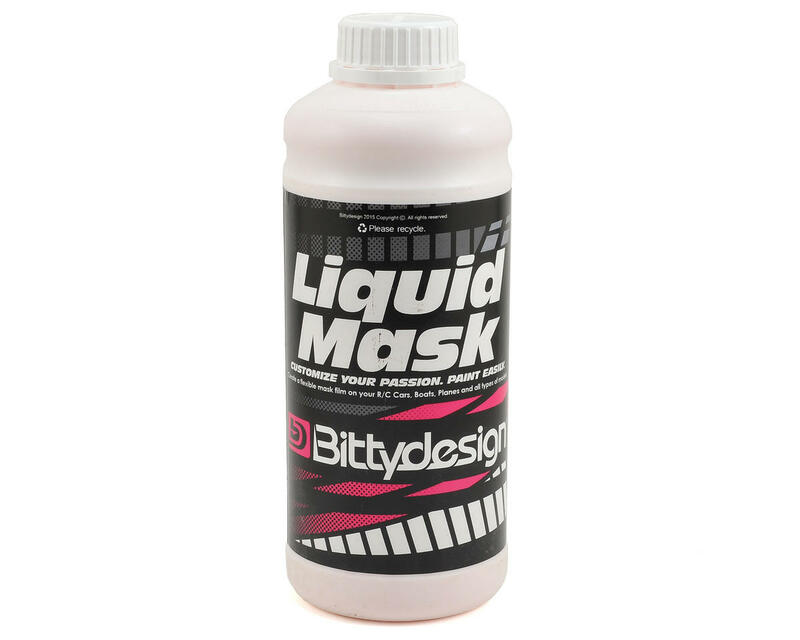 Bittydesign Liquid Mask will save you time and help you produce a better finished product. This 32 ounce bottle will cover approximately 20 1/8 buggy bodies. I'm not an expert painter, just your typical hobbyist. Anyway, I've tried this and the Bob Dively liquid mask. I have to apply a lot more Dively to get it to peel off without tearing. This peels very easily with 3 coats brushed on. To me, the odor is no stonger than Dively's. Both work. This comes off easier to me. Disagree with any 5 star review. Haven painted over 280 bodies so far and (98% with Dively) I thought I would give the Italian **NEW** stuff a shot. I buy tons of mask and I am always looking to save a nickle for my paint customers. Although this stuff does work, it is no where near as well as Dively. Both apply about the same except Bitty has an odor that will choke a goat. Major hangover puke bucket flashbacks upon application. Having allowed at least 12 hours between coats I found this didn't dry evenly like Dively. The cuts were more difficult to see through the cleaver pink added color, which I found no use for (this may be the source of the odor). Bitty also did not stay planted on the shell as well as Dively. It did not allow for bleeding, but just didn't cut like Dively nor perform near as well. Still better than tape, so (2) stars only if the Dively is out of stock. Very, very good liquid mask to use. I have used them all and like this one the best on Rc bodies. Super easy to cut and pull out of bodies. You owe it to yourself to try it. This stuff works!!! Not sure why people bash the odor, I have been painting for a little bit now, this stuff applies great with a brush. I usually do 3-4 coats and it peels back up perfectly, Only thing I have noticed is sometimes when doing trims and cuts in hard edges..for example pan car wings, the edge will come up and not stick to well to the body..I think this is a cause of not letting it dry as long as it should or having excess mask on the edge where it accumulates. Regardless of that most likely being user error. The mask works awesome. Will continue to use this and then some! For those who are worried about oder, bought this about a month ago from me posting this review, and they probably changed the formula because I applied it with a brush and no painting mask and I could barely notice a stench, slight smell, nothing out of the ordinary..I suggest this mask for the average painter or someone who is a professional. Happy with this product. applies well and have not had any issues with areas going on too light and tearing. don't notice any smell as others have said. the pink color is a little different and not quite as transperant as the light blue masks but the coverage makes up for it. I have used the well known liquid mask for years and decided to give this a try. Application is great with brush or spray. Peels smoothly from easily made cuts unlike the ones I used before. I plan on buying more of the Bittydesign liquid mask for future paint jobs. great product, I have a body ready to paint in 24 hours accelerating the drying process with a hair dryer, just having a bad odor! !